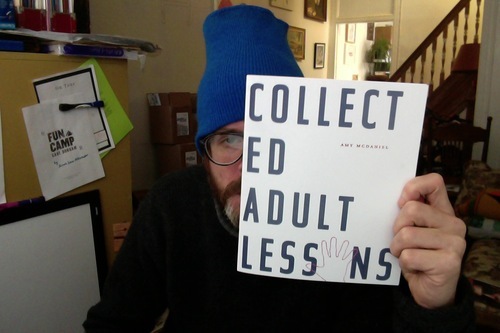 Here collected are fourteen poems, three from Amy McDaniel’s original chapbook Selected Adult Lessons (Agnes Fox 2010) and eleven previously uncollected—all great. Presented in oversized size for easy reading, some of the poems are long and some are short. Sometimes the poems make their own jokes and, like in the Guided Meditation, sometimes they ask you to make the joke or for your best facts about animals. Wait, what are your best facts about animals? Somehow I know that dogs are six times faster than I am. I’m proud of this book because Amy let me help with the design, and all the elements of what makes a book a book were called into question and dealt with accordingly. For instance, since there are only fourteen poems we numbered the poems instead of the pages. Check it out for $5 here.